Colder weather sends herbs into dormancy. This is the time of year to turn our study to herbs easily found at the grocery store or can be grown in pots inside. 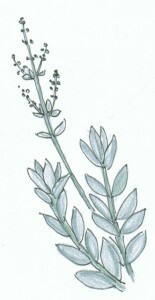 November’s herb fits this bill nicely: Sage. This herb has so many valuable uses! Read all about the medicinal side of Sage and learn how this much loved culinary herb can do more than spice up your Thanksgiving stuffing! There are plenty of recipes to use Sage and since this herb does so well as food, you can make your medicine and eat it too! 33 pages from cover to resource page.